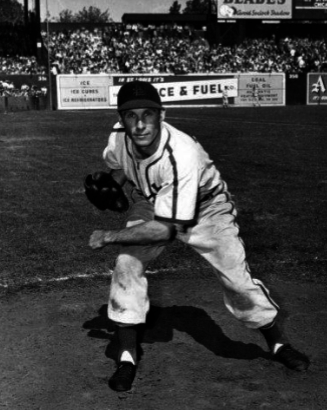 Harry “The Cat” Brecheen had previously entered major-league baseball’s record books in 1946 by becoming the first left-handed pitcher to win three games in a World Series. He figuratively came within a cat’s whisker of making history again on May 8, 1948, when he missed hurling a perfect game because of a close call on an infield grounder. Brecheen earned his feline nickname by virtue of his superior fielding ability. He reminded people of a cat when he sprang off the mound to pounce on groundballs hit near him.2 His smallish physical stature, 5-feet-10 and 160 pounds, also contributed to the analogy. After beginning the 1948 season with two shutout wins, the 38-year-old Brecheen got his third start on May 8 against the Philadelphia Phillies at Sportsman’s Park. Blix Donnelly drew the starting assignment for the Phillies. In front of 15,471 spectators, Brecheen blitzed through the Phillies’ starting nine the first time by recording outs via three strikeouts, three fly balls, two popups and one groundout. The Phillies’ lineup that day featured rookie Richie Ashburn, who had gotten off to a solid start and had an average near .300 at the time. The Cardinals got their first run against Donnelly in the bottom of the fourth inning on a two-out walk by Enos Slaughter and a run-scoring double by Whitey Kurowski. Brecheen retired the entire Phillies lineup the second time through in a similarly routine fashion as in the first three innings, including three more strikeouts. The Cardinals scored their second and third runs in the bottom of the sixth inning by loading the bases on a double, walk, and single before Nippy Jones’s single scored Stan Musial and Terry Moore. In the top of the seventh inning, Brecheen retired Putsy Caballero and Richie Ashburn for his 19th and 20th consecutive batters without allowing a runner. The next batter, rookie Johnny Blatnik, was playing in place of the regular left fielder, Harry Walker, who was working himself into condition after an early-season bout with the flu.3 Blatnik drew two strikes before hitting a slow groundball along the third-base line. Brecheen retired the next seven batters to record his first one-hitter. The Cardinals had added two more runs in the eighth inning on Jones’s two-run homer for a final score of 5-0. As one might expect, there were different points of view on Pinelli’s fateful call. Brecheen finished the season with a 20-7 record, winning 11 of his last 14 decisions. He led the league in ERA (2.24), shutouts (7), and strikeouts (149), even though he wasn’t generally known as a strikeout pitcher. From a statistical standpoint, he was arguably the league’s best pitcher, although the Braves’ Johnny Sain also turned in a spectacular season with 24 wins, a 2.60 ERA, and a second-place finish in the league’s MVP voting. The combination of Brecheen’s pitching and Stan Musial’s hitting essentially kept the Cardinals in contention during the 1948 season. However, the Boston Braves took the National League lead on June 13 and never relinquished it. The Cardinals wound up topping Brooklyn and Pittsburgh for second place. Only two games separated the three teams in the final standings. If there had been instant replay technology in 1948, Pinelli’s self-assured call at first base would have been reviewed and possibly overturned, and Brecheen would have secured another rare place in baseball history with a perfect game. But on that day in May, the umpire’s call was the final word. “Brecheen Continued Southpaw’s Reign in N.L.,” The Sporting News, December 29, 1948: 15. Nowlin, Bill, ed., Van Lingle Mungo: The Man, the Song, the Players (Phoenix: Society for American Baseball Research: 2014), 202. Pietrusza, David, Matthew Silverman, and Michael Gershman, eds. Baseball: The Biographical Encyclopedia (New York: Total Sports Illustrated, 2000), 120. 1 Mike Eisenbath, The Cardinals Encyclopedia (Philadelphia: Temple University Press, 1999), 140. 2 Gene Karst and Martin J. Jones Jr., Who’s Who in Professional Baseball (New Rochelle, New York: Arlington House, 1973), 100. 3 Bob Broeg, “Shutout No. 3 for Southpaw as Cards Clip Phillies, 5-0: Jones Wields the Big Stick,” St. Louis Post-Dispatch, May 9, 1948:1D. 6 Ray Gillespie, “The Cat Misses Perfect Game by a Whisker,” The Sporting News, May 19, 1948: 7. 8 Babe Pinelli, Mr. Ump (Philadelphia: Westminster Press, 1952), 128. 11 Jerry Crasnick. “Perfect Moment Stolen in Time,” June 3, 2010, espn.go.com/mlb/columns/story?id=5245331&columnist=crasnick_jerry.